Kristin has always loved taking photos of life's milestones. As her friends started having babies, her focus naturally turned to photographing the little ones. Now a new mother herself, she continues to photograph babies and families. 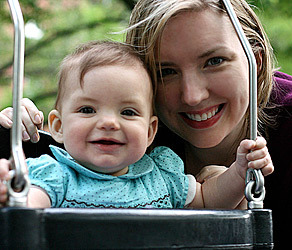 She enjoys showing babies in their natural habitat - in their rooms, with their toys, wrapped up in their parents' arms. Unlike in a studio setting, she comes to your home to help your baby's unique personality to shine through.